This week Throwback Thursday celebrates the 20th anniversary of the World Wrestling Federation’s game-changing King of the Ring ’98, as seen on the WWE Network! Momentum in the “Monday Night Wars” was on the side of the WWF by the end of June 1998 when King of the Ring ’98 took place. This event is best remembered, however, for the infamous Undertaker/Mankind Hell in a Cell; more specifically Mick Foley’s two ungodly bumps. The match has gone on to become one of the most viewed battles in wrestling history. The match was so big that it overshadowed the rest of the card. As the years have gone by the match has nearly overshadowed itself, with the legends and lore of the encounter creating an entity as menacing and unforgiving as the Hell in a Cell itself. History records King of the Ring ’98 as a one-match show, with only the infamous Hell in a Cell saving the event from obscurity. But is that really the case? Let’s hit ‘play’ and find out! As for edits on the Network it looks like only the WWF Superstar Line segments are snipped. Most of the “WWF” blurring and muting has been restored though a few stragglers remain. Context, meanwhile, is complete with all prior editions of Monday Night RAW and all previous PPV currently available on the Network for you to enjoy right now! 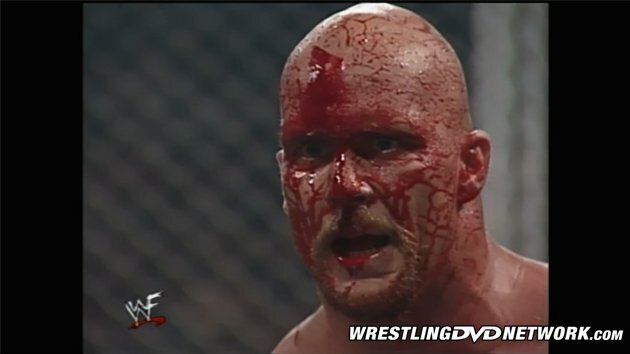 The show opens with a prophecy/revelation-themed vignette highlighting the “first blood” WWF Championship match between Kane and Champion Stone Cold Steve Austin as well as the Hell in a Cell showdown between Undertaker and Mankind. In the arena the pyro goes berserk and Jim Ross welcomes us to the show. J.R. and Lawler chat about the coming HIAC match and the prospect of Kane setting himself on fire. This is our first “bonus match” of the night and the Pittsburgh crowd is loving it. Taka is dressed in Headbanger gear and does some decent moshing, which gets a great reaction. This is a fun, fast-paced opener that gets the already hot crowd going even more with some good lucha-style action. In the end Funaki misses an diving elbow from the top before being crushed by a Headbangers’ assisted splash from Taka and finished off with the Michinoku Driver for the pin at 6:44. After replays J.R. and “King” chat about the upcoming tag team match between Too Much and All Snow & Head when Sable, getting a massive pop, introduces the hated Mr. McMahon (joined by Pat Patterson and Jerry Brisco). As Sable leaves the ring Patterson pats Sable on the rear end and Sable clocks Patterson for another big pop. Mr. McMahon asks the fans what they came to see, with Kane setting himself on fire the clear winner, and tells the fans they’ll be disappointed, like they are with their own lives, all but promising that Kane will leave Pittsburgh as the new WWF Champion. After replays of Sable slapping the bejabbers out of Pat Patterson we see the updated bracket for the 1998 King of the Ring tournament before Tennessee Lee introduces Jeff Jarrett. The story of this match is Shamrock’s knee, which Jarrett and Lee eventually target. In the end Shamrock makes the comeback and hits a hurricanrana before ending things with the ankle lock at 5:30 to advance to the Finals of the 1998 King of the Ring tournament. After the match Shamrock drops Lee with the belly-to-belly suplex. The Rock comes to the ring with The Godfather and Mark Henry but Godfather and Henry get sent to the back before they know what hit them. As Severn comes to the ring we see footage from the June 8, 1998 edition of RAW of Severn submitting D’Lo Brown with a bow and arrow, injuring D’Lo in the process. Severn was still undefeated at this time, having yet to be pinned or submitted in the WWF. Severn looks great on offense but looks lost in respect to selling and telling a story. Late in the match Godfather and Mark Henry both distract the referee as fellow Nation member D’Lo Brown, debuting his trusty chest protector, hits a gorgeous, devastating Frog Splash on Severn enabling Rock to score the pin, breaking Severn’s “streak”, at 4:26 to advance to the Finals of 1998 King of the Ring tournament and dashing any hopes of a Shamrock/Severn Finals showdown. After the match Michael Cole interviews The Rock at ringside who says that Shamrock is going to have to go through “this man and a half” and that he will make Shamrock hit “rock bottom”. We see a replay of the finish and the updated tournament bracket before we get a vignette detailing the return of Al Snow (and Head) to the WWF and Al Snow’s desire to get a “meeting” with Mr. McMahon. Before the match begins it’s announced that Jerry Lawler is the guest referee. The story in this one is all about Al Snow trying to overcome the numbers of Too Much and Jerry Lawler’s terrible refereeing but being unable to do so. In the end Head gets the hot tag and takes out Too Much (with Snow’s help) before Snow lands the Snowplow on Christopher but Snow isn’t legal. Lawler grabs something at ringside and hands it to Christopher as Snow lands a Snowplow on Taylor. Meanwhile Christopher attaches Lawler’s item to Head and scores the 1-2-3 at 8:29 though Snow believes he’s won the match by pinning Taylor. After the match we learn that Lawler’s item, used to pin Head, was an empty bottle of Head & Shoulders shampoo. Al Snow argues with Head as we see replays of the finish. Next we see footage from the June 15 and 22, 1998 editions of RAW of Owen Hart and X-Pac getting into it, including X-Pac busting Owen open with a steel chair shot to the back of the head. This one (Waltman’s first PPV match since WCW’s Fall Brawl ’97) starts like their King of the Ring ’94 semi-final meeting, only it’s X-Pac who levels Owen before the bell. This is a very good, physical, fast-paced match. After a superplex attempt goes awry, and with the referee distracted, Mark Henry splashes X-Pac on the floor before Chyna gets in Henry’s face and Vader, out of nowhere, attacks Henry. As Henry and Vader brawl on the floor, distracting the referee, Owen cinches in the Sharpshooter on X-Pac who taps out as Chyna enters the ring and drops Owen with big DDT to give X-Pac the pinfall win at 8:32. J.R. tosses to a promo for Fully Loaded: In Your House 23 though the promo has been removed. This is the second “bonus match”. Thankfully this would, essentially, mark the end of the NWA experiment in the WWF. The match is not good, and that’s putting it kindly. In the end Cornette attempts to interfere and gets hit in the pills by Chyna for his troubles. Moments later the Outlaws hit a massive Hotshot on Holly to score the pin at 9:56 to retain the World Tag Team titles. After replays of Chyna going low on Cornette and some awkward Superstar Line editing we see the updated bracket for the King of the Ring tournament ahead of the finals. Next WWF European Champion Triple H (with Chyna) come to the ring for some guest commentary work. This match marked the true end of the Rock/Shamrock story, the program that launched “The Rock” to superstardom, and the beginning of the long-running Rock/Triple H feud, which nearly comes to blows when Triple H spits water in Rock’s face early in the match. The story here, like the Jarrett/Shamrock match earlier, is all about Shamrock’s injured knee. This is a good match that’s given just enough time to develop and to tell a decent story. The end comes after an irate Rock, busy mouthing off to the referee, ends up trapped in Shamrock’s ankle lock. Rock struggles for the ropes but ends up tapping out at 14:11 to give Shamrock the tournament win. “The pain these two men are preparing to endure,” J.R. says, “is inhuman.” There’s not much that needs to be said about this must-see match. Perhaps the most famous match of the era behind only the “Montreal Screwjob”, this was the second official Hell in a Cell in Federation history and is without question the most “extreme” match in company history, changing the lives of the men who fought in it–and the entire industry–forever. After enduring two hellacious falls, ring stairs, thumbtacks and more Mankind is crushed with the tombstone piledriver and pinned at 17:14 to put his legendary bloodbath to bed. After the match the medics come in and try to assist Mankind as we see replays of the carnage. Mankind refuses to be stretchered out, walking under his own power to the back to a standing ovation. Next we see a great vignette highlighting the Kane/Austin feud. At the time of this match Austin was dealing with a serious staph infection in his right elbow and it’s a wonder Austin even worked this match. This is a brawl with the Hell in a Cell coming into play early before these two fight all over the place in one of the better “first blood” matches you’re likely to see. Late in the match the referee goes down and Mankind hobbles to the ring with a steel chair. Austin drops both Mankind and Kane with Stunners before Undertaker makes his way to the ring with yet another steel chair. Undertaker swings for Mankind but ends up knocking Austin’s chair back in Austin’s face, splitting the Champion wide open. Undertaker clears the ring, tosses the referee back in, and then dumps gasoline all over the ref as Austin makes his comeback. Austin is armed with a steel chair, looking to draw first blood on Kane, when the referee sees that Austin is bleeding and calls for the bell at 14:52. This marked the end of Steve Austin’s first (of an eventual six) WWF Championship reign at 91-days and marked Kane’s lone WWF Championship victory. After the match Paul Bearer celebrates as a stunned Stone Cold Steve Austin argues with the referee. In the sky box we see Mr. McMahon smile gleefully at Sable as the PPV goes dark. Though it’s best remembered for the “Hell in a Cell” massacre the 1998 King of the Ring is a solid show from start to finish, with the exception of the Tag Team title and Too Much/Al Snow matches. There is a lot to like in this show and it holds up rather well 20 years later. If you haven’t seen this show in its entirety in a while or you’ve never seen it, I highly recommend checking it out! Already a subscriber to the WWE Network? Then you can relive this classic King of the Ring event or see it for the very first time right now! As always, let us know what you think in the comments below. For more WWE Network news visit our friends at WWENetworkNews.com. Thanks for reading – until next week, see ya at ringside! Watch every single WWE, WCW and ECW PPV event in history over 10,000 hours of content on the WWE Network. Your first month is FREE! Click here to subscribe to the WWE Network. 20 years later it still amazes me how Mick Foley is able to walk after that match. He is so lucky he didn’t get paralyzed. I think its safe to say that we will never see anything like that again. It’s more than safe to say that we’ll never ever see anything like that ever again. Not only bc WWE is PG now but bc Vince was angry and after the match thanked Mick but said he never wants to see anything like that ever again. Once he noticed Mick wasn’t there, Taker said to take it home as in end it so Chokeslam onto tacks, Tombstone, match “mercifully” as King said, over. Taker walked out slowly as JR said “he may never be the same again” and he was probably right. Taker himself said during the build to No Mercy 2002 that he did what he to HBK and Foley but then asked what has he done to himself and what will he have to do to himself to defeat Brock Lesnar. In saying all that, it’s not just Mick Foley even though that’s what’s mostly remembered/talked about regarding HIAC, KOTR 98. The intro was awesome. 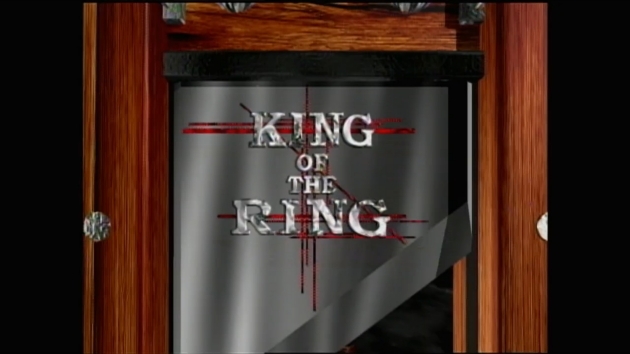 Tied with the 1996 edition, this is my favorite KOTR intro! Back when even intros meant something unlike now except maybe for WM. X-Pac vs Owen Hart was a great solid contest between two talents with that similar high flying style. I don’t remember if this feud carried over. If it didn’t I wish it did at least to the next month’s ppv, Fully Loaded IYH. Shamrock vs Rock was a great rivalry. One of Shamrock’s best or his only best rivalry in his entire WWF career. One of Rock’s pre-main eventing portion of his storied WWF career. Shamrock won but unlike Bret, Owen, Austin, maybe HHH, Angle, most definitely Lesnar, Shamrock’s win was more or less a total waste. Makes me wish KOTR was still a June ppv w/the winner getting a guaranteed title shot against the World Champion of the KOTR winner’s brand at Summerslam. Same for Queen of the Ring which should be at the same June ppv except this time titled King and Queen of the Ring! Taker vs Mankind is a legendary historic encounter in which idk what to say that hasn’t been said about it already? Everyone talks about what Foley went through. Rightfully so. But what about Taker? No he wasn’t thrown off or fall through the top of the structure. But the excellent camera visual of him walking ever so slowly and not bc of his character should clearly show what he went through also. It is absolutely amazing that after all he went through Taker is still wrestling at 53 and seemingly more than Lesnar even is! I respect Taker even more than I already did for that. He’ll stop when he wants to bc if any non chosen factor like age, injuries, nothing to prove, no one left to face, Streak ended, etc he’d have stopped by now. WM30 latest definitely. Kane vs SCSA was a good one though everything considering I’d have finished the event w/Taker vs Mankind. Not the first time a big event didn’t close w/the World Title match. Probably will happen again. Though he needed help and lose it back 24hrs later I was happy for Kane as a talent here. Just never understood heel or face why big guys like a Kane or Taker who are so dominant suddenly need inference or help to win/retain a Title? Kane here needed it. So did Taker in his first 3 Title wins. Well no need it isn’t accurate. The question is why did they get it when they’re so big, dominant & have one of if not the highest pain threshold in the entire biz? ?